Whole30 101: Can I do the Whole30 as a Vegetarian or Vegan? We welcome vegetarians to our community, and want you to reap many of the benefits of our healthy-eating plan while still honoring your ethical or religious obligations. In fact, we’ve had a loyal vegetarian and vegan following for many years now, and we created a special section of our Whole30 Forum just for you. Despite the fact that these lifestyle choices seem in conflict with our healthy eating recommendations (which requires a moderate amount of animal protein every day), please don’t rule our program out! We actually have quite a few things in common and believe the Whole30 has a lot to offer you, even if you choose to limit the inclusion of animal products in your diet. Please note, if you are strict vegan or won’t complete the Whole30 using only your limited animal protein sources (like eggs and fish), what we’re outlining here isn’t the Whole30. You’re choosing to include plant-based protein sources in your daily diet, which means your program doesn’t follow the guidelines we’ve outlined. Still, we are thrilled so many of you want to join our community, embracing the commonalities in our approaches rather than the differences. We’ve created these recommendations specifically to make you feel welcome and help you change your health, habits, and relationship with food using our general framework. A little tough love: this isn’t a pass to do a “Veg Whole30 + beer.” (Yes, while many beers are technically vegan, it’s never Whole30.) We still expect our vegetarian and vegan Whole30’ers to follow all of our rules related to added sugar, alcohol, and baked goods and treats, even if you do include some grain, dairy, or legume-based protein in your version of our program. 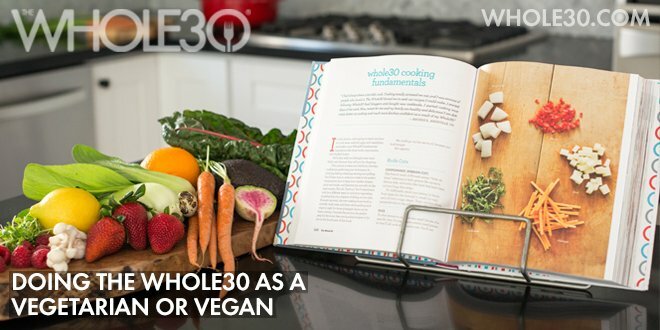 Vegan resources from #Whole30… use our framework + community to change your life! If your primary reason for becoming vegetarian or vegan was for health, we invite you to reconsider your approach for the next thirty days. We believe the inclusion of some animal protein (not dairy) in your daily diet is necessary for optimal health, and we’ve provided well-reasoned, well-sourced arguments in It Starts With Food to back up our position. If this is where you are coming from, give our plan a try! Consider it a self-experiment: Go back to eating high-quality animal protein as part of your Whole30. If you don’t experience the benefits you hope to see, you can simply return to your vegetarian/vegan lifestyle having learned a bit more about how certain foods work for you. If your concerns are largely ethical—animal welfare, sustainability, your local economy, or global economic factors—know that there are ways to responsibly, ethically source meat, seafood, and eggs. In fact, supporting those efforts sends a strong message (financial and otherwise) to the large corporations invested in factory farming; you’ll have more of an impact voting with your dollar than you will opting out of the system altogether. We believe it is important to create an alternative food-supply system, but that cannot be done without the support of committed consumers like you. Refer to the “Meat, Seafood, and Eggs” chapter in It Starts With Food (starting on page 141), and page 404 in The Whole30 for more information on sourcing responsible animal protein options, or visit Diana Rodgers at Sustainable Dish for resources. For those of you who have texture or conceptual issues with meat but want to try to incorporate it back into your diet, we can sympathize. Whole30’s own Melissa Hartwig was vegetarian for several years in college, and still has texture issues with meat on the bone or fatty steak. Check out her tips for the reintroducing meat back into your diet on page 121 of The Whole30. If you’d rather proceed with your version of the Whole30 using vegetarian or vegan preferences as a framework, we have two options available to you: the general guidelines as outlined in The Whole30 (for vegetarians), or a fully detailed Vegan Reset outlined in Food Freedom Forever. Vegetarian Reset: If you’ll eat some animal products (like eggs and/or fish), we recommend getting the all of your protein from these sources and NOT supplementing with plant-based sources at all for the 30-day period. While this approach may sound tedious, it provides a huge learning opportunity! You’ll get tired of eggs, salmon, sardines, and cod, but remember, this approach is only for the sake of this experiment. The benefit of that is you can completely eliminate and carefully reintroduce plant and dairy-based protein sources (like tofu, Greek yogurt, or quinoa), to evaluate how well they work for you in vegetarian life after the Whole30. Resources for this approach are available starting on page 120 in The Whole30: The 30-Day Guide to Total Health and Food Freedom. Vegan Reset: I created a Vegan Reset (starting on page 50 in Food Freedom Forever) to help vegans improve cravings, hormonal balance, digestion, and calm systemic inflammation while still honoring their desire to eliminate all animal products from their diet. It uses many of the same guidelines as the Whole30, but helps vegans choose less commonly problematic plant-based protein sources, and plans a careful reintroduction to help them figure out which protein sources are healthiest for them going forward. You can also read more about our general philosophy on adapting the Whole30 for a vegan diet starting on page 120 in The Whole30: The 30-Day Guide to Total Health and Food Freedom. Both programs can be supported through the Vegetarian section of the free Whole30 Forum, or on Instagram using the tags #vegetarianWhole30 or #vegWhole30. We also featured Laurice’s story on the blog; you can find others by Googling “Vegetarian Whole30” or “Vegan Whole30.” Finally, download a template for our vegetarian/vegan shopping list. Note, this list won’t include any Whole30 non-compliant items. (Listing “tofu” on a Whole30-branded shopping list would be extremely confusing for the new folks.) If you’re modifying our program as a vegan, you’ll have to fill in your own plant-based protein sources—don’t worry, we’ve left you lots of space. While it’s impossible to do the Whole30 as written as a vegan, our community is warm, welcoming, and incredibly supportive. We hope you can use these resources here to help you use our framework and philosophy to arrive at your own perfect food freedom diet, whether that includes any animal products or not.